When the Thirteenth Doctor’s rainbow-accented costume was first revealed, I was admittedly a little reticent. I didn’t dislike it, per se, but there was a quirkiness to it which made it stand out much more than the typical aesthetics of Doctor Who’s modern Time Lord couture. But the more and more we see of season 11, the more the ensemble really works. As we’ve started getting little snifters of new Doctor Who information thanks to Comic-Con recently, we’ve had the chance to see more of the new Doctor’s outfit within the actual context of the show, rather than a glammed up press photo like the first reveal. I mean, they’re all glammed up press photos in a way, but the reveal image was specifically for publicity, the others are just official grabs from actual footage from the new season. But glam aside, these pictures have given us a chance to really see what this new Doctor looks like as we’ll see her in action this fall, and I’ve gone from liking it to loving how perfectly Doctor-ish it is. The latest picture released goes a long way for doing that, mainly because a) it amplifies the excellent, cape-esque silhouette a long coat brings, and as we all know, capes are good, and b), the shot itself is very evocative of the Romanticism movement – in particular Caspar David Friedrich’s famous painting Wanderer Above the Sea of Fog. It inspires similar feelings of wanderlust, which really, when you get down to it, is as core to what Doctor Who is as time travel or angry pepperpot aliens. The Doctor and her new friends Yasmin, Graham, and Ryan. All wearing very nice coats. The initial quirkiness of the Thirteenth Doctor’s rainbow accents and bright blue culottes is muted a little. There’s this still interesting mix that, at first glance, she could blend in with a crowd of humans, and be hidden among us in the same way the Ninth Doctor could with his minimalist jacket. But then there’s also still enough to it, a bright splash of colour here or “weird” design motif there, that stands out to draw your attention to this slightly peculiar, intriguing individual. Scan over that group shot, just barely taking details in, and your eyes keep floating back to the Doctor. 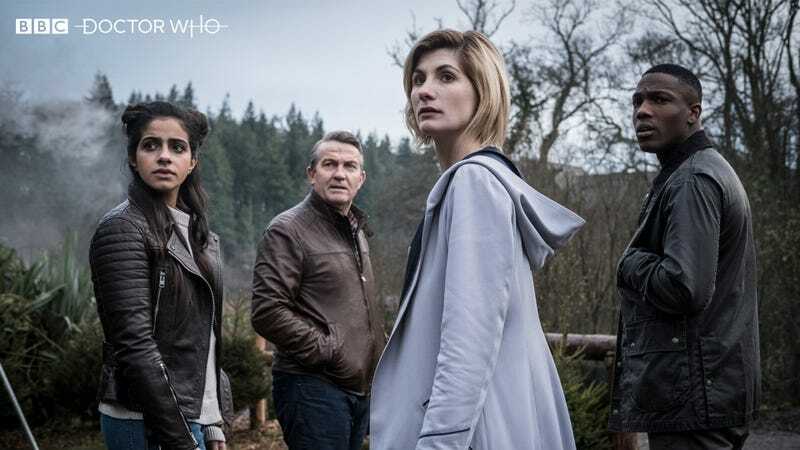 On the surface, the Thirteenth Doctor’s outfit might look a little more artificially offbeat compared to her modern counterparts, in their fancy suits and jackets and their own cape-esque coats. But there’s an alien, ethereal vibe to the outfit that really shines when viewed within the confines of Doctor Who itself, rather than just through the lens of a press photo. That, and the coat really is quite lovely.